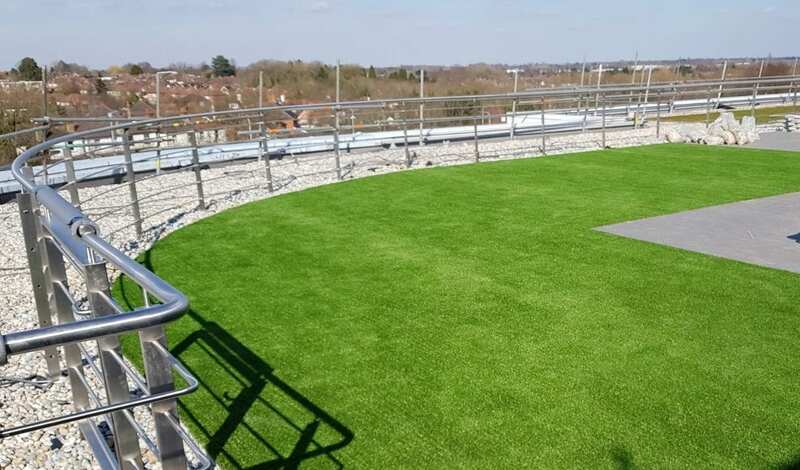 We recently installed artificial grass as part of roof renovation for a business in Guildford Business Park. This one came with a few challenges as you might expect with a building with 5 storeys high. Originally the renovations taking place would have meant having access to a crane. This is by far the easiest way to get your materials on the roof, but unfortunately this became unavailable at short notice. Our team then had the fun job of maneuvering 4m width rolls up multiple flights of stairs. Thankfully as it was a roof installation, in this case it only required a lay only. This meant that the typical installation materials like aggregate and sharp sand were not required for sub-base. Instead the most important secondary items were the tape and adhesives which would be used to secure and joint the grass. 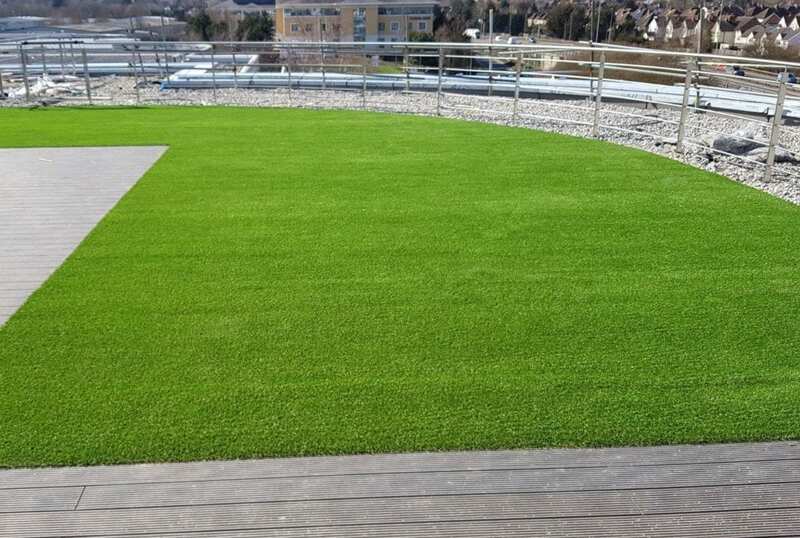 The company chose our 32mm Trulawn Luxury for the installation which is our flagship product and a consistent bestseller. This is a good choice for an area that will be exposed to the elements as it is highly durable; meaning it will cope better with weather and require less maintenance. It also has an authentic look and feel which is an important consideration for a corporate business that wants to maintain a professional image. We also added an additional 5-10mm of kiln sand on the top of the grass, making sure to brush this in thoroughly with our power brush. As this area has limited shade or light variety, this helps counteract some of prolonged exposure to sunlight. 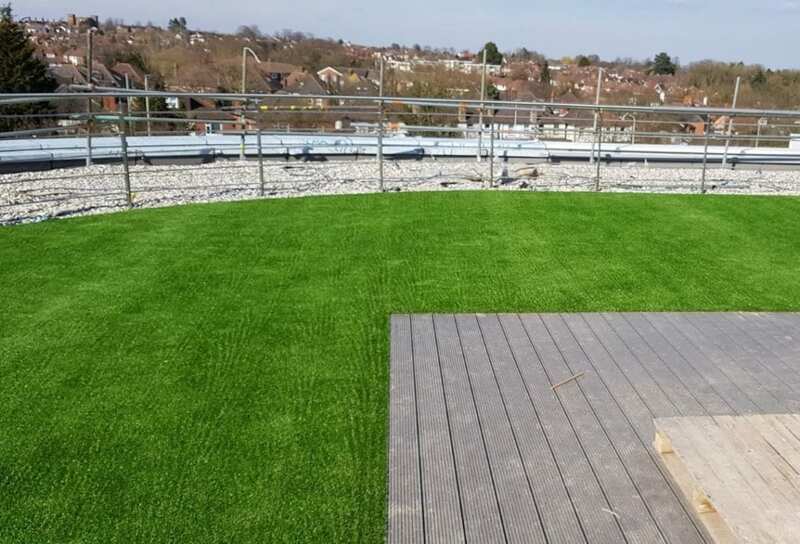 Sometimes it’s not all plain sailing when it comes to an installation, especially one on a roof, but if you keep a calm head and know what you’re doing it will all work out in the end right?